Listed below are some of the many links to other websites which have been highlighting or commenting on the work of Incredible Edible Todmorden. Todmorden High is the school is the first in Calderdale to be selected by the new lottery-funded Food for Life Partnership to become one of 180 flagship schools and communities across England that will be recognised as national leaders on food quality and food education, the news says. This was the great news Patrick talked about at the conference on Saturday. To read the ‘hot off the presses’ article go to the Todmorden News website. 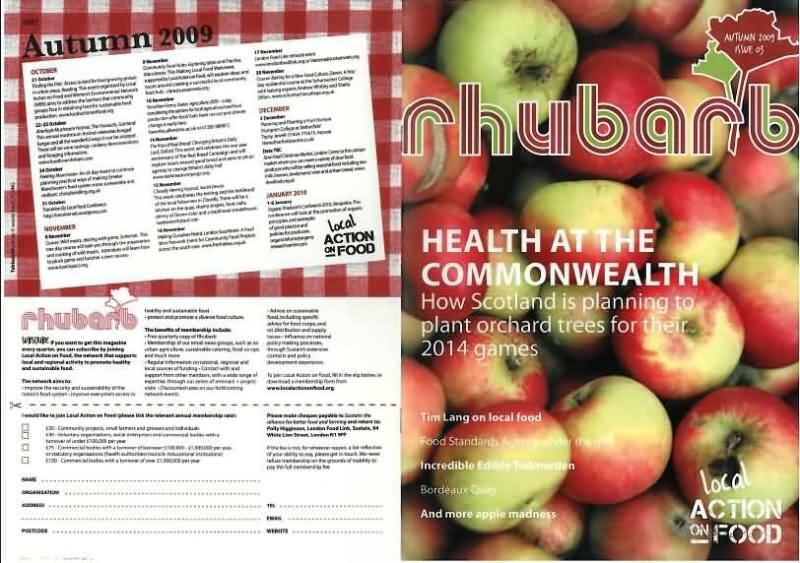 Article in Rhubarb Magazine Edible Todmorden leads the way…..
in the ‘grow your own’ revolution, it continues. What a super article, they have generously give us a two page centre spread. When the first page is an article by Professor Tim Lang who initially inspired Pam, who then told Mary, and with a name from Emily, which gave us Incredible Edible Todmorden. How can we not feel more than a little delighted. and this is the fab mag that the article appears in. Thanks very much guys we love Rhubarb. The Halifax courier reports on the first licence to be given by Calderdale MBC to Incredible Edible Todmorden, Presented to Nick Green on behalf of the council by Councillor Ian Cooper, cabinet member for community services. We think Calderdale MBC has taken a lead here for other councils to follow. It is good to have a council that can see the community good in a project and then find ways to help move the project forward, as CMBC has by issuing these licences. Malcolm Seville’s memory will live on. Marianne Sutcliffe won the cup for a bowl of strawberries, tomatoes, apples and even a lemon, shown at IET harvest festival. The award was presented at Todmorden Agricultural show by Emmerdale actress Jane Cox, who plays Lisa Dingle. The article tells how HRH Prince Charles had the opportunity to talk to the incredibles twice when they were chosen as one of the SDC’s champions of the twenty first century. Nick will be given the first community growing licence by Councillor Ian Cooper at Ferney Lee Old Folks on Monday July 13th. It is just great the way the council has come on board with Incredible Edible and found ways to help and work together with us to spread this wider to the whole valley. Some councils just don’t get it yet, but ours does big time and it is brilliant. We’re a winner – twice over! Todmored News who were in at the birth so to speak, and have been generously reporting the progress of IET from the very beginning tell the next chapter in our exiting journey. The Yorkshire Post article on the SDC breakthrough event. The first out of town newspaper to publish the Incredible Edible story The Yorkshire Post cover the Incredibles in London for the SDC 21st Century Champions event. Incredibles are down in London, showing just what can be achieved when communities grow together. One of just 19 projects chosen by the Sustainable Development Commission as breakthroughs for the 21st Century. Todmorden News cover the healthy prospects of Incredible Edible. The project grows stronger every day, as this article shows. Now we will be able share even more with Tod’s growing community IET will be moving into their new headquarters thanks to the generosity of health centre owners. While we were busy at Longfield with the IET and Pennine housing roadshow, last Sunday, another exciting first was happening just up the road at Walsden. Ramsden Farm, opened its gates to the public to celebrate Open Farm Sunday, raising awareness of where the food we all eat comes from. 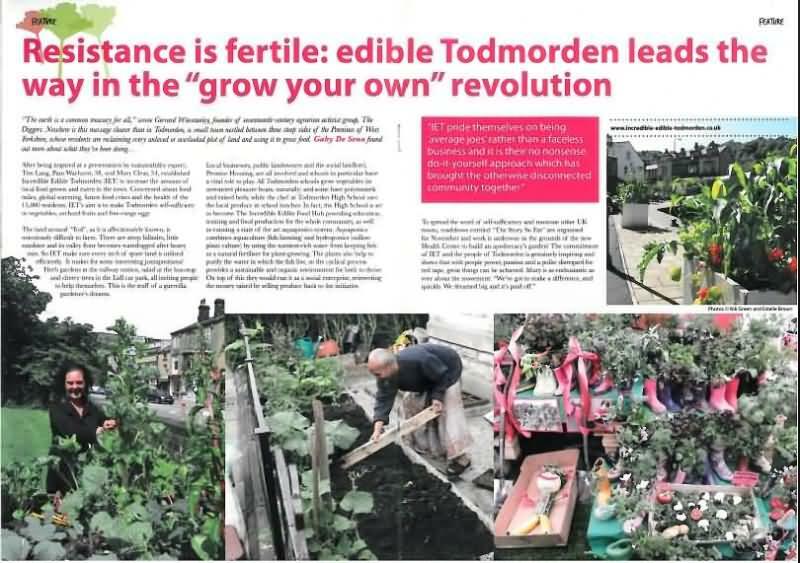 The government’s advisor on architecture, urban design and public space, have done a three part case study of Incredible Edible Todmorden covering all aspects of what we are about. This is a very uplifting article and after reading all three pages I feel like we really are achieving something, and that is all down to the folk who are so kind and willing and get involved. So take a look at what CABE say about IET, and be sure to click the ‘description’, and the ‘evaluation’ links on there as well. With summer judging just around the corner volunteers have been out in force. Todmorden News tells the story of planting groups united to make Tod blooming wonderful. A shared passion for our town brings people together to plant barrier baskets and flower beds. That will be the message of Transition Leek. Steve Hilton, visited Todmorden to see first hand how things were progressing here in Tod, now Transition Leek are forging ahead growing local and seasonal. Their first major project is already under way. The incredible Edible ethos really floats British Waterways Boat. This quote from the Halifax Courier is very heartening. New Start is the toolkit for regeneration practitioners. It’s a creative and informative magazine and more. Almost two thirds of New Satr readers are chief executives or directors: the magazines unique content is depended upon by people who are determined to make communities better. Digging for the future in Todmorden! Todmorden News update on egg map launch. EGG production is now on the map and anyone interested in keeping hens can learn from the experts through Incredible Edible Todmorden. Sent to us by Chris Swift , thanks Chris. An alternative field trip could be related to food security.